In this guide we’ve listed and reviewed the 5 best space heaters for large rooms so you can choose a suitable model capable of warming up the air in your spacious home during the cold chilly winter season. There are different types of space heaters such as electric heaters and kerosene heaters. Our list comprises of both types of heaters and so you need to choose one that’s suitable for your heating needs while keeping in mind each type of heater comes with its own advantages and disadvantages. In each review, we’ve stated out the features of each heater together with the pros and cons so you can make a solid decision on which model is more likely to meet most, if not all, of your heating needs. If you all you want in a heater is fast and instant heating, then Duraflame 9HM8101-O142 Portable Electric Infrared Quartz Heater is a great choice. Your room will be warm and lovely in only 10 minutes, and you will have the opportunity of enjoying more comfortable and humid air, unlike when you are using an alternative heater. Well acknowledged for offering additional zone heating for about 1,000 square feet, Duraflame Infrared Electric Quartz Heater 9HM8101-O142 keeps natural humidity in the air to make the room calm without drying out. On the other hand, you don’t have to worry about it burning your pets or kids due to the fact that the heater stays cool to the touch. Furthermore, the overheat protection technology will make sure that the Duraflame Infrared Quartz shuts off even before it overheats. 6 Infrared Quartz Heating Elements – These are for getting immediate heat without any basic preheating. The Remote – This remote is used for the effective control of the unit from the comfort of your couch. The heater maintains the humidity in the air, making you get pleasure from comfortable and moist heat without having to dry out the air in your room. All about the controls of Duraflame Infrared Quartz Heater looks great, easy and intuitive. The remote control is very easy to maneuver, and does its job even from all over the room. 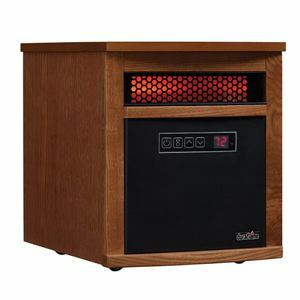 On the whole, the Duraflame Infrared Quartz Heater will never disappoint you because it is a great and small heater. When your home is older with bad insulation, you can use this heater to reduce the cost of heating. It will keep your room several degrees warmer without using more energy. The heating element of this heater is a quartz tube, a popular material that helps it to emit heat easily and almost immediately. When it comes to choosing the best heater for heating your home, the Duraflame Infrared Quartz Heater is highly recommended. It is ideal for children and pets. With it, you can enjoy a sound sleep because it is not too loud. In addition, it pushes out clean air, unlike some of the available heaters that pollute the air. The Dyna-Glo Delux KFA80DGD Kerosene Forced air Heater is the key, if all you want in a heater is sturdiness, and top-quality heating performance. This heater gives instant liberation from cold weather situations and it is perfect for commercial, industrial, and residential uses. KFA80DGD air heater will keep you warm and calm on those chilliest days. When it comes to heating the outdoor surroundings of your home, Delux air heater from Dyna-Glo performs surprisingly well. But the truth is that it is makes noise, meaning that you have to speak louder when it is running, so that you can enjoy your discussion. This heater is rather powerful and capable of generating abundance of heat for all the rooms in your house. More importantly, Dyna-Glo Delux KFA80DGD Heater gives the comfort needed to drive cold away completely. The Thermostat – Switches the unit on and off, depending on the temperature. Original Double Heat Technology – Offers a simple to use switch for minimum and maximum settings for utmost fuel savings, console, and heat control. The Twofold Source Power Cord – Lets you to charge your cell phone for you not to lose an outlet. The Air Pressure Gauge and Pump Screw – This is the feature that lets you adjust for most favorable pressure and performance. The Run Time Fuel Gauge – Informs you about how many hours the fuel has left, in order for you to plan in advance. The Integrated Safety Sensors – In the improbable overheat condition or incident of a flame-out, these safety sensors shut off the heater to keep you secure. Big frontage handle, back handle, and flat-free 10 inches wheels – Make the heater easiest to move in its category. The High Temp Composite Nozzle Adapter – Remains cool and guarantees that the hoses fit tight and uphold pressure throughout the lifespan of the heater. It is 98 percent fuel efficient. Without mincing words, Dyna-Glo KFA80DGD Kerosene Forced air Heater has all it takes to be the best air heater on the market. It is the best choice for those who want to conquer cold weather. It performs really well when heating outdoor surroundings. Nevertheless, it can be too loud but will not disturb you. You just have to speak a bit louder to enjoy your conversation. Many of the customers that bought and use this heater recommend it to others who are looking for an air heater. In addition, it is highly rated on Amazon as one of the best selling products. If you are looking for a professional grade heater that will generate heat for your garage almost immediately, look no further than the Dyna-Glo RMC-FA125DGD. It is a liquid propane forced air heater designed to heat about 3,100 square feet of your garage. 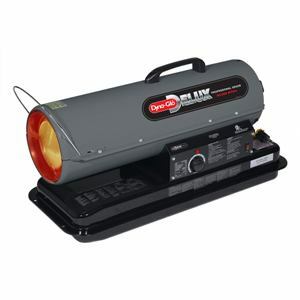 This heater will supply heat to every area of your garage evenly, using its powerful blower. What makes Dyna-Glo RMC-FA125DGD Liquid Propane Forced Air Heater different from other propane heaters is that it makes use of an uninterrupted variable heat control system to control overheating effectively. Making it an admirable choice for your handy heating needs, Dyna-Glo Delux 125K BTU Heater is not just perfect for outdoor/indoor edifice, but also for commercial and industrial applications. This heater gives a 125,000 BTU utmost capacity, and doesn’t need electricity for its operation. Regulator and Hose Assembly and Electronic Ignition – These features allow for swift installation and start-up. Variable Heat Setting – Guarantee the total control of thermal comfort. Adjustable Height Control – Guarantees that you will surely obtain the heat you want, as soon as you need it, and at the very point or place you want it. CSA certified, meaning that the quality and functionality is guaranteed! It has a wide coverage for areas as big as 3,100 square feet. The only weakness and complaint about this heater is that its runtime is limited. With this Dyna-Glo RMC-FA125DGD Liquid Propane Forced Air Heater review, it can be concluded that this heater is the best way to go if all you need in a heater is efficiency and quality. Going by reviews and feedback from previous users, the product has received positive reviews and high ratings. Nearly all these customers recommend this heater to those who may still need one. Its features, functionality, and unique nature make it perfect for both indoor and outdoor use. 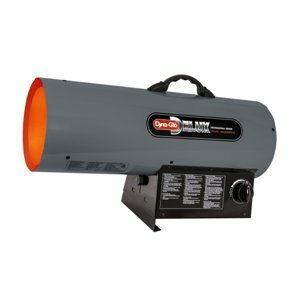 When you are looking for the best propane garage heater for your use, Dyna-Glo RMC-FA125DGD should be the number one on your list, given its high adjustable BTU and the high rating and recommendations received from customers. In addition, it boasts incredible features that adjudged it one of the best heaters on the market that will offer you value for your hard-earned money. Give it a try today and enjoy wonderful heating experience! Mr. Heater F270270 MH75KTR Contractor Forced-Air Kerosene Heater is designed particularly for instant heating of large spaces. 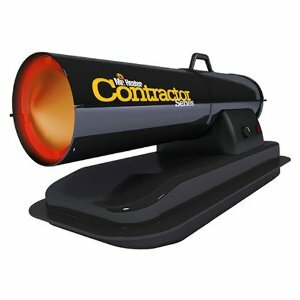 This Heater is up to the task, whether you want to use it on your project site or in a garage. It is designed with premium components to guarantee many years of reliable service. You can expect faithful service and long life from your Mr. Heater Forced Air Kerosene heater with its split upper shell planned for high output and easy maintenance. This heater naturally heats up a lot of space quickly. It comes with a photo CAD cell and a high-limit safety button to shut off the heater in unsafe conditions. This heater can be used with no worries and center’s your attention on other tasks at hand. Moreover, you can put Mr. Heater together within 5 minutes out of the box and it boasts the best cold weather starting capability as far as the industry is concerned. One great thing about this unit is that it works at very low temperature. It can comfortably heat a space of up to 1,875 square feet and can work for 11 hours when its 4 gallon fuel tank is full. Overheat shut-off protects the heater from dangerous temperatures. It manages to light in the cold, even by making use of the cold weather lighting methods suggested in the instructions. Mr. Heater F270270 MH75KTR Contractor Forced-Air Kerosene Heater comes with exceptional features that adjudged it one of the best on the market today. You can use it at your project area or garage. In addition, this heater has attracted quite a lot of positive reviews and high ratings from customers. If you want a reliable heater that will not disappoint you, go for Mr. Heater. Irrespective of your heating needs, Mr. Heater is up for the task. It is easy to operate and manage. It can heat up a very large space within a very short time. It is a kerosene heater with all the versatility and safety characteristics required. Give it a try today and see how you can benefit from its quality heating experience! Are you seeking a space heater that mixes the style and comfort of a conservative stove with the power of a contemporary space heater? 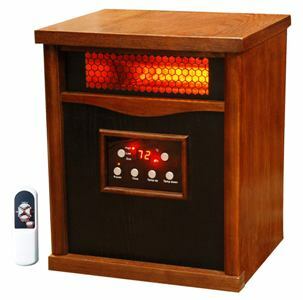 Then LifeSmart 6 Element Large Room Infrared Quartz Heater is all you need. Life Pro infrared heater is a safe substitute for other heating sources. Interestingly, the heater does not have any heated element exposed to the outside air. It is very easy for you to touch a heated element accidentally and burn yourself in the process with a lot of heating gadgets on the market now. But this is not possible with this large room quartz heater as Lifesmart Company took the design of this particular heater to the next level. This particular heater was designed with your safety in mind. Six-element Quartz heater has elegant, modern design that will keep you safe without cutting down the amount of heat it produces. You will have an improved heating experience all year round with the unique combination of heat distribution systems and heating elements of LifeSmart Life Pro. This heater will heat the whole room within a few minutes. In other words, you don’t need to be anywhere very close to the heater before you can experience the warmth. The Life Pro heater will distribute the heat to all the corners of your room with its 6 heating elements and will not compromise humidity or oxygen levels, unlike a lot of space heaters that will just create a small heated environment around the heater itself. In order to increase the efficiency of each quartz element and double the general heat output, each of the six heating elements is separately wrapped with metal. As far as efficiency is concerned, it is more efficient than other heaters you can find on the market. Dual Timer – This can be used for adequate regulation of the heater. You can set it up to 12 hours in advance, particularly if you want to leave the device running when going to sleep, and you don’t want to leave it running all night long. ECO Saver Setting – Designed for heating smaller areas to 68 degrees making use of just 500 watts. E Z Glide Casters – Let carrying the heater from one room to another easy. 2 Tone wood Cabinet Finish – Used for providing efficient heat and makes the heater stylish. Larger Remote Control – Used for operating the Digital Thermostat for an ultimate control. LifeSmart 6 Element Large Room Infrared Quartz Heater is an efficient and attractive choice for you if you need comfort in your workshop, studio apartment, den, office, or home. It is reliable and powerful with its fans operating quietly to make sure the heat circulates all round the room. 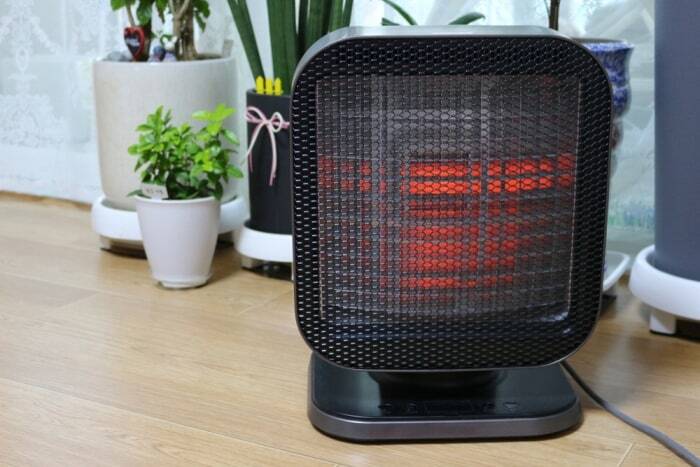 Due to the quality and efficiency of this heater, it received four stars rating or more in more than 90% of the reviews and recommended by almost all those who used it. If you’re looking for a cheap, safe to use, and efficient infrared heater that operates in style, it is recommended that you buy Lifesmart infrared heater. It was gathered from LifeSmart 6 Element Large Room Infrared Quartz Heater review that the heater is ultra-efficient for a big room and it offers you safe and secured heat. With this heater, you will avoid wasteful disposable filters. Any of the best space heaters for large rooms that we’ve reviewed above can be a good choice for heating up a spacious room in your house. Again, it all depends on your personal taste and preference when it comes to choosing a space heater for your heating needs. But as long as you’re specifically looking for a space heater that can comfortably heat or warm up a large and spacious room, then you can’t go wrong with any of the models reviewed above. Some are a bit pricey but definitely worth it in terms of performance and reliability. Any questions about choosing a large room space heater can be left in the comments section below and we’ll get back to you with our thoughts as soon as possible.